Often, the right fastener means the difference between your work standing the test of time or collapsing under its own weight. Read on for details on a few common screw types and their most common applications. Knowing exactly the right screw to use for your project saves time and energy. Plus, it ups the chances of whatever you’re putting together actually staying together. 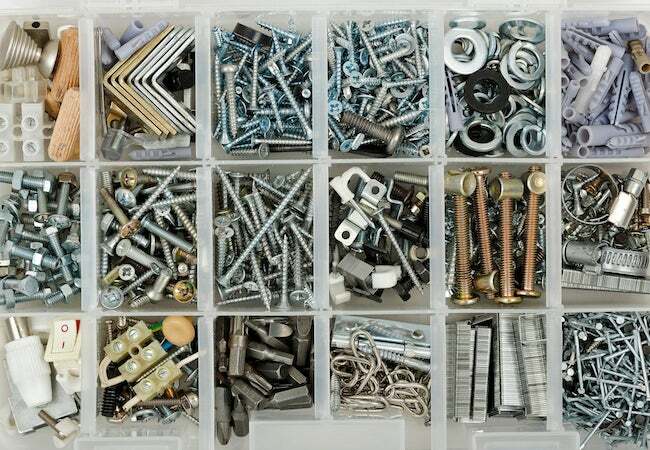 Here’s a quick review of the most commonly used types of screws among DIYers. Wood screws feature coarse threads that dig securely into wood as you drive in the fastener. Towards the head, though, wood screws tend to be smooth, making those last few turns easier. Note that some require a pilot hole, while others are self-tapping. Drywall screws are self-tapping and range in length from one to three inches. Their specialized heads are designed to be driven slightly beneath the surface of the drywall (without tearing the drywall’s outward-facing protective paper). Masonry screws, used to anchor wood floor plates to concrete slabs, require pre-drilled pilot holes in every scenario, simply because unlike most other screws, the masonry variety doesn’t come with a pointy tip on the end. Though similar to wood screws, deck screws come treated in one of multiple possible coatings. The right deck screw to use depends on the type of deck material (pressure-treated wood, say, or composite) you’re drilling into.